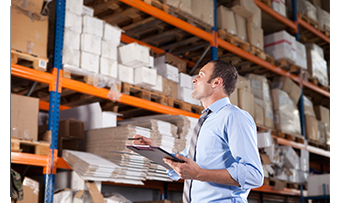 Increased Visibility and Control Over All Warehouse Operations. Real-time information, make informed decisions and deliver best results. The warehouse landscape has radically changed in the past few years. As a result of customer demand for faster and more accurate deliveries, the emphasis is now focused on accelerating product flow and managing costs. To complicate the issue, product customization, such as order assembly, packaging requirements, compliance labeling, and other delivery requirements, are becoming standard. The challenge is to manage, simplify and control this increasingly complex use of your facilities and the greater demands on your employees’ time efficiently and effectively. With DEX WMS, companies can build and operate world class supply chains for profitable growth. Our solution integrates and automates all key supply chain processes, from design, planning and procurement to manufacturing and fulfillment, providing a complete solution set to enable companies to power information-driven supply chains. Companies can anticipate market requirements and risks, adapt and innovate to respond to volatile market conditions, and align operations across global networks. A unified data model provides a single, accurate view of your entire supply chain. Companies can implement lean, demand driven principles and manage their increasingly complex, global supply chains. Since DEX WMS works as a standalone module or in unison with your ERP, you speed implementation times, optimize performance, streamline support - and maximize ROI. Designed as a complete suite of modular product life cycle management applications, DEX Systems Software help you improve performance, lower IT costs, and get better results. Whether you choose one module, or the entire suite, DEX enables you to gain the benefits of our applications at a pace that matches your business needs.